I love my college. I love it so much that I never gave up my dream of being accepted there, even after receiving a rejection letter. I love it because it offers exactly what I want to learn and in spite of the fact that I really can't afford it. The crazy thing is that I'm not an anomaly on my campus. There are tons of Facebook groups where students from my school discuss their struggle to pay for the next semester and ask each other for advice on how to finance their education. With the fall semester looming, statuses are all turning toward the deadline for tuition payment, scholarships (and how there aren't enough), and the stress of coming up with tens of thousands of dollars twice a year. It doesn't end there, though. For all of my college graduates out there, congratulations! Are you still talking about how you're going to pay off your student loans? I bet you are. College has become a game of accessibility: It's not just can you get in, but can you afford to stay in and finish? In some cases, students are going hungry just to budget for the living expenses that come with being a college student. An article in the LA Times reported that 1 in 10 of California State University's student population is homeless. Everyone is applying for the same Federal aid and many of the same scholarships. A 2014 report showed that students age 25 and older accounted for 40 percent of all college and graduate students, yet grants and scholarships cater to students ages 18-24, making accessibility an even greater issue for students outside of that age range. This leads me to a startling thought: The American Dream has changed, and college is the new mortgage. With housing costs on the rise nationwide, most people are renting and many people have roommates. 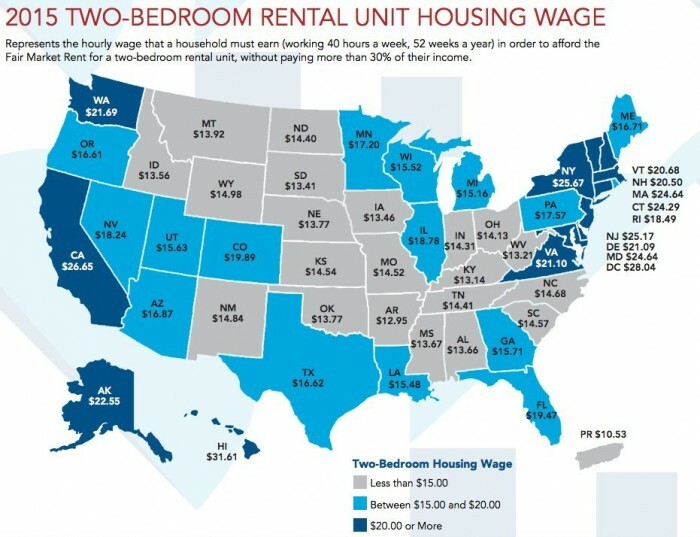 The photo below shows the average hourly wage needed to afford a two-bedroom apartment by state. Because the conversation is no longer about owning property. It's about the least amount of money one needs to make to keep a roof over their head. Although minimum wage has been raised to $15 per hour in many parts of California, the average wage needed to rent a two-bedroom apartment is almost $27 per hour, meaning that a college student working a minimum wage job full time would not be able to afford a place to live on their own. They would need multiple roommates in a small space. If the stress of paying for college isn't enough, then there's the stress of living with a bunch of people as well, and without college, you're almost guaranteed to make a lower wage. Accessibility is the rock, college is the hard place, and students are increasingly finding themselves stuck between them. This 2016 report from Student Loan Hero shows U.S. student loan debt totaling $1.26 trillion. It also shows that 43.3 million Americans have student loan debt, and that just over 11 percent are delinquent on their loans. That means that even once many have graduated and earned their degrees, they still couldn't afford college. Like the real estate bubble, will the education bubble burst at some point? There is a continued debate on whether there's a need for the resurgence of vocational high schools to give students who can't afford college a fair shake at earning a living wage after being trained in a marketable skill. What can colleges themselves do to raise accessibility for students? How can companies attract talent by helping new graduates tackle their student loan debt? The cost of college is a problem that must be solved, lest we all find ourselves educated vagabonds eloquently asking each other for spare change. Want more opinion pieces like this? Sign up for our daily newsletter!